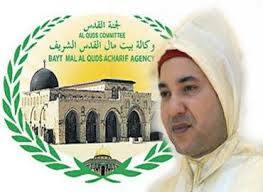 King Mohammed VI, Chairman of the Al-Quds Committee of the Organization of Islamic Cooperation, has denounced the Israeli authorities’ continued, systematic violations in the city of Al-Quds Al-Sharif and around the Al-Aqsa Mosque, in blatant violation of international law. In a letter addressed to UN Secretary General António Guterres, King Mohammed VI deplored the Israeli actions which undermine regional and international efforts to revive the peace process that could lead to the resolution of the Palestinian-Israeli conflict. Israel has recently taken a number of serious provocative measures, said the Al Quds Committee Chairman in his letter, recalling in this regard the unprecedented celebrations marking the fiftieth anniversary of the annexation of Al-Quds and the Israeli government development plans for the Old City, including the digging of more tunnels, the installation of elevators and the construction of corridors. The provocative actions cited also include the Israeli bill requiring Arab schools to teach Israeli curricula and use textbooks to Judaize education in the occupied city of Al Quds. King Mohammed VI also recalled Israeli draft bill on Greater Jerusalem, which aims to annex Israeli settlements in the West Bank as well as other areas in East Jerusalem, the ‘unified Jerusalem’ bill, which undermines chances to reach an agreement on the city’s future and the bill that bans the adhân (call to prayer) in Jerusalem and the surrounding Arab neighborhoods. According to the Al Quds Committee Chairman, these bills show the escalating Israeli comprehensive campaign launched against the Old City in Al-Quds Al-Sharif and its surroundings by confiscating Palestinian land, by denying Palestinians the right to build and by carrying out arbitrary evictions. “As if all those illegal practices were not enough, Israel has taken even more serious measures. On Friday 14 July 2017, it proscribed the Friday prayers, closed Al-Aqsa Mosque to worshipers for three days and, for the first time in half a century, banned the call to prayer. It also detained, for several hours, Sheikh Mohammad Hussein, the Mufti of Jerusalem and Palestinian territories”, states the royal letter addressed to the UN chief. Israel has increased tension in the region by introducing additional provocative and unacceptable security measures, installing surveillance cameras throughout the Al Aqsa Mosque compound as well as security gates to check the worshipers and assaulting officials and employees of the Islamic endowment department, deplored King Mohammed VI. “These illegal actions undermine the dignity of the inhabitants of Al Quds and constitute a provocation for all Palestinians. They may lead to an outpouring of anger and an overall public reaction that could compound the situation in the Palestinian territories”, added the Monarch. “These provocative practices arouse the feelings of Arabs, Muslims and freedom lovers in the world. They could incite extremist tendencies that may lead to further tension, animosity and violence in the entire region”, stressed the Al Quds Committee Chairman. “Given this alarming situation, I cannot but strongly condemn these unacceptable Israeli policies in my capacity as Chairman of the Al-Quds Committee”, said King Mohammed VI, calling on the UN Secretary General, the international community and the influential powers to compel Israel to put an end to those practices, through which it seeks to impose a fait accompli and decide singlehandedly the fate of the City of Jerusalem – an issue which should be addressed within the context of final status negotiations. The Monarch called the international community and the UN Secretary General to compel Israelis to respect the legal and historical status of Al-Quds Al-Sharif and the Holy Places, and to ask them to cancel all illegal measures, including the additional security arrangements. The Monarch insisted on the centrality of the issue of Jerusalem and its special spiritual significance, pointing out that “No infringement on its symbolic character or its time-honored cultural identity can be tolerated,” and warning against “the risk of turning the issue into a religious conflict, and exploiting the cultural heritage to incite hatred, fuel extremism and undermine the ideals of tolerance and affection between the followers of the revealed religions”. Written by: Jaber Ali on July 26, 2017. Posted by Jaber Ali on Jul 26 2017. Filed under Headlines, World News. You can follow any responses to this entry through the RSS 2.0. Both comments and pings are currently closed.